Geneise Ruth Lautenschlager was born on a farm near Davenport, Nebraska on July 13, 1919, to John and Bertha (Sanner) Lautenschlager. Geneise was baptized and confirmed in the Christ Lutheran Church of Davenport by Pastor Dumler. She attended country school near Davenport and graduated from Davenport High School in 1937. Geneise was married to Vere Tucker McLaughlin December 31, 1936. Six children were born to this union: Jack, Ralph, Lyle, Gary, Linda, and Terry. She resided in and around Davenport until her family purchased a farm near Hebron in 1945, the family joined the Christian Church in Hebron with Pastor Ralph Dyer in 1948. 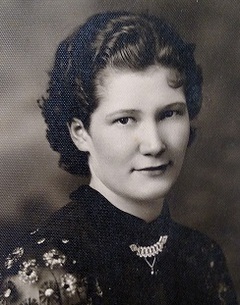 Geneise was preceded in death by her husband Vere, her parents John and Bertha Lautenschlager, one son Terry, daughter-in-law Linda Kay McLaughlin, one grandson Kurt, brothers Roy, Jarvis, brother-in-law Everett Clay Camp, and sister-in-law Donna Lauthenschlager. Step children Neal, Carolyn, and Lee Hendershot. Geneise married Walter (Red) Hendershot in 1965, Walter passed away in 1985. He is survived by one daughter Jeanne Sorge of Dallas, Texas. Geneise was united in marriage to an old high school friend in August of 1987, Elmer Braun. They enjoyed many trips together including a visit to Europe and a trip through the Panama Canal. Geneise was Past Worthy Matron of Eastern Star, Manager of Blue Rivers Area Agency in Hebron for ten years. She served as past President of Women’s Achievement Club. She taught Sunday school and was President of the church women. She helped serve Election Day dinners for many years at church. She also did volunteer work for the Hospital Guild. She had many hobbies including quilting, gardening, and playing cards and attending Legion Club dances! Geneise will be forever remembered by sons Jack and Nancy McLaughlin, Fort Scott, Kansas, Ralph and Judy McLaughlin, Lyle McLaughlin, Hebron, Gary and Rena McLaughlin, Lincoln, Nebraska and daughter Linda Simonsen, Hebron. Step daughter Jeanne Sorge, Dallas, Texas. Grandchildren Amy and Tom Lohmeier, Hebron, Ken McLaughlin, Lincoln, Nebraska, Kevin and Elda McLaughlin, The Villages, Florida, Steve and Michelle McLaughlin, Omaha, Nebraska, Nancy and Tom Kruse, Gretna, Nebraska, Randy and Becky McCartny, Omaha, Nebraska, Matt and Amy McLaughlin, Omaha, Nebraska, Shelly and John Ullman, Lincoln, Nebraska, Kelly McLaughlin, Lincoln, Nebraska, Joni McLaughlin and Janele, Lincoln, Nebraska, Pat and Andy McLaughlin, Lincoln, Nebraska, Sally McLaughlin, Denver, Colorado, Jeremy Simonsen, Lincoln, Nebraska. Step grandchildren Jeff and Anne Ferron, Omaha, Nebraska, Julie and Matt Deloney, Fort Scott, Kansas, Jeff and Kristen Ramsbottom, Dallas, Texas, Patricia and Kristen Pohlman, Murfreesboro, Tennessee, Jared and Rachel Hendershot, Plattsmouth, Nebraska, Stacy and Nathan Jones, Council Bluffs, Iowa. Geneise is also survived by brother Irl Lautenschlager, Cater Lake, Iowa, sister Sylva and Don Finke, Lincoln, Nebraska, sister Marlene Claycamp, Edgar, Nebraska, and sister-in-law Marilyn Lautenschlager, Hastings, Nebraska. Also surviving are numerous great grandchildren, cousins, nieces, nephews and friends! She had a rich and full life and will be greatly missed by all! Funeral services were held Tuesday, September 4, 2018 at the First Community Church, Hebron, Nebraska with Pastor Steven Speichinger officiating. Burial was in Rose Hill Cemetery, Hebron.